This is an easy Korean "salad" that my mother would always make with Western cabbage (yang baechu). While we ate it, she'd usually reminisce about how she used to make this as a replacement for kimchi when she first moved to America. She couldn't always find Korean cabbage or didn't have the storage space, time or materials necessary to make large batches of kimchi. These days, now that you can easily find bagged coleslaw in grocery stores, this Korean coleslaw is easy to make. There's no mayo, so this coleslaw is light and pairs well with both picnic food and Korean meals. Pour over the cabbage, onions, and scallions. 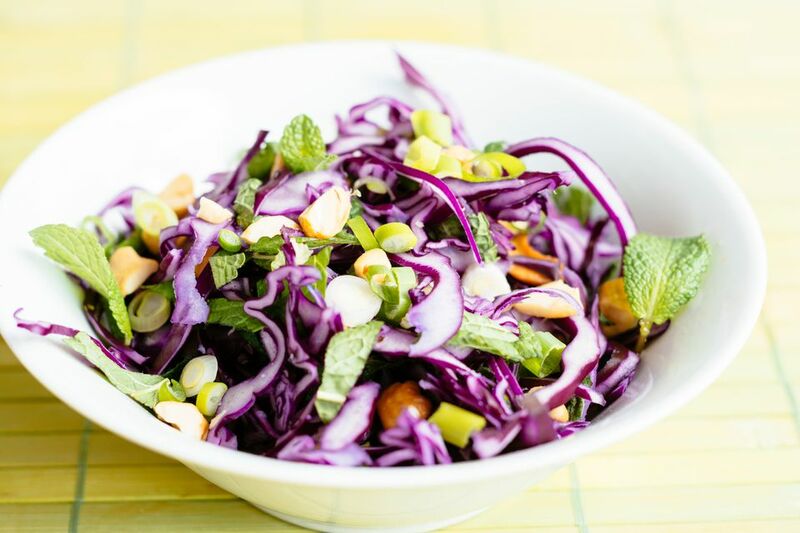 You can eat the Korean coleslaw immediately or wait a few hours for the flavors to deepen and combine. It is thought that wild cabbage was brought to Europe around 600 B.C. by groups of Celtic wanderers. It was grown in Ancient Greek and Roman civilizations, and those people held it in high regard as a general panacea capable of treating a host of health conditions. Through history, cultures and societies have used cabbage to treat ulcers, cancers, depression, for strengthening the immune system and fighting against a cough and cold, healing wounds and damaged tissues, for the proper functioning of the nervous system and to treat dementia. Cabbage, along with broccoli, cauliflower, and brussel sprouts, has a reputation for fighting cancer. While it's unclear when and where the headed cabbage that we know today was developed, cultivation of cabbage spread across northern Europe into Germany, Poland, and Russia, where it became a very popular vegetable in local food cultures. The Italians are credited with developing the Savoy cabbage. Russia, Poland, China, and Japan are a few of the leading producers of cabbage today. There are slightly different benefits with the different varieties of cabbage but always try to avoid overcooking cabbage so that you preserve the nutrients in the vegetable. Cabbage offers abundant vitamin C. In fact, you might be surprised to learn that cabbage is richer in vitamin C than oranges and other fruits. Vitamin C, an antioxidant, helps to reduce the wear and tear in the body. Cabbage also contains fiber, potassium, and other nutrients. Of any vegetable, cabbage has the lowest calories and fat. One cup of chopped, raw cabbage contains only 21 calories and none of those calories are from fat, according to The Daily Plate nutritional database. Cabbage is rich in a variety of vitamins and minerals, especially vitamins C and K. In fact, one cup of boiled cabbage provides 91.7% percent of your daily vitamin K needs and 50.3% of your daily vitamin C requirements. Cabbage also is a very good source of manganese, vitamin B6 and folate, and a good source of vitamins B1 and B2, calcium, potassium, vitamin A, and magnesium. Cabbage contains trace amounts of iron, zinc, and manganese.